I use books and a video to introduce the Preamble to the Constitution to my students. This is a book that kids can work on together to create illustrations for your own class book. I sometimes create 2 class books so that everyone can make their own individual page. You can use the blank pages to have the kids draw pictures and/or write sentences that tell what America means to them. You can use this in a variety of ways. The books I use are for younger children. However, there are many other books and videos available that could be used with older children. 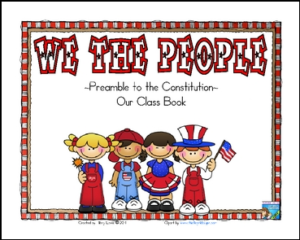 I hope you this packet helps you teach your students about The Preamble to the Constitution of our United States of America.